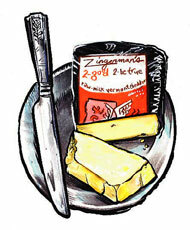 Zingerman's 2 year aged cheddar for sale. Buy online at Zingerman's Mail Order. Gourmet Gifts. Food Gifts. If the only mature cheddars you've tried have been bitey and bitter, the creamy, smooth intensity of this one will really be a revelation. It has a very nutty flavor somewhere between the gentleness of our 1 year aged cheddar and the intensity of our 4 year aged cheddar. Dry like a good red wine, it has a big round flavor, and each piece has a creamy, buttery texture that complements the long, lively finish. I almost never tire of eating it. Try some on salads, in cheese sauces, on sandwiches and as a snack. You'll keep coming back.